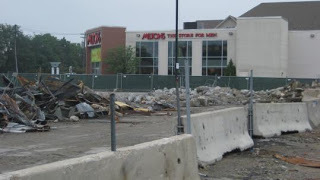 Newton, MA Real Estate News - New Grocery Store! For those of you that shop at Bloomingdales, and the Chestnut Hill Mall, you may have noticed a large commercial property being demolished across Route 9. For several months I've been wondering what was being built in it's place, and today I found out. Newton MA real estate owners and residents are getting a new grocery store! Wegmans Food Markets of New York will be opening its third grocery store in Massachusetts. Their first store opened recently in Northborough, and is their first grocery store in the state. They are currently building a second store in Burlington. The projected opening date for the Newton store is early 2013. Currently Newton has several large grocery store options, including Star Market, Trader Joe's, and 2 Whole Foods Market's. Newton's close proximity to Boston and excellent school systems has made it an extremely desirable location for families and professionals. Unfortunately with those desirable features comes high real estate prices. In 2011, the average sale price of a single family home in Newton is over $900,000!